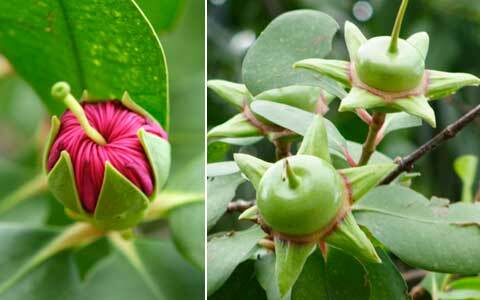 Mangroves in the Maldives are normally found in depressions of islets locally known as Kulhi. Some species of mangroves also grow along island lagoons. 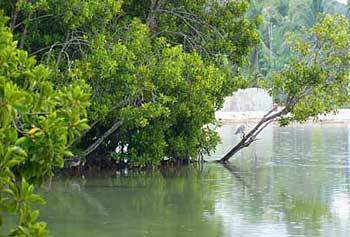 Mangrove areas are highly productive ecosystem contributing to the food chains of atoll islands. They are also important to the atoll ecosystems, as they filter out silt, nutrients and sand that would otherwise go out to the house reef around the islands, suffocate corals and encourage algal growth. Most of the native plants in the Maldives are salt tolerant. Most of the plants that grow on the coastal vegetation belt around islands although very salt tolerant but differ that of mangroves. This was quite visible in the 2004 Asia's tsunami disaster, most of the native plants survived leaving dead all the introduced and naturalized plants in tsunami-affected islands. The depression-oriented mangroves are found in less saline areas and floras are different from mangroves found along lagoons, appear to lack any visible link to saline water. The effect of the saline water penetrating into the depression through the sand during high swells and tides, lead some part of forest inundation. Although mangroves grow in salt water, they need regular flushing with freshwater. Mangrove species that grow near a salt water dominated atoll depressions in atoll islets differ that of fresh water and they are very similar to that of coastal vegetation. At least two types of mangrove crabs are found in mangrove swamps in the Maldives and local islanders do not eat or harvest them. Crabs are vital part of the mangrove ecology, influencing both nutrient cycling and forest structure by flow of water through crab holes. 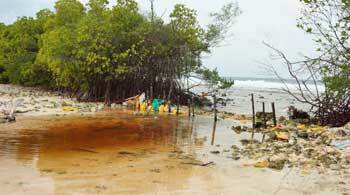 Mangroves depressions or Kulhi, protect coastline from erosion, provide a breeding ground for crustaceans and fish. Milk fish is the common fish found in fresh water dominated mangroves swamps, on which the local population depends on as a staple food when the sea is rough and tuna and other pelagic fish is scare. Harvesting and managing of milk fish in the mangroves is done traditionally by the island community as whole. Mangrove crabs that are found in mangrove swamps are vital part of the mangrove ecology, influencing both nutrient cycling and forest structure by flow of water through crab holes. This unique fragile atoll environment is not adequately protected in the Maldives, which ecologists have long recommended should enjoy special protection. Regrettably, few people in the Maldives understand the importance of mangrove forest and no proper regulatory measures are in place to conserve these vital atoll ecosystem. Except two Mangrove sites Eidhigali kulhi, S. Hithadhoo of Addu Atoll (5th June 2004) and Kaafu Huraa (14th June 2006) declared protected. Some mangrove areas across the Maldives archipelago have been destroyed by reclamation for housing, tourism, agriculture and commercial purposes. In many islands, sadly mangrove swamps are still use for disposal of garbage, of both organic and inorganic origin . Recently, one of the largest Kulhi in Shaviyani Nalandhoo uninhabited island has been leased to private company by the Government for aquaculture of alien sea cucumber specie from India. Destruction of mangroves in the Maldives has posed serious problem of intrusion of salt water into the island fresh water lens making groundwater brackish. Mangrove Crab not a favorite food in the Maldives. Mangroves are usually found on the ocean side of the islands in the Maldives. Islands with mangrove ecosystem locally known as Kulhi tamed furious waves of tsunami before hitting the settlements, where the power of tsunami was absorbed by layers of mangroves and through crab holes. Without these mangroves many deaths and destruction to properties could have occurred in many islands in North of Maldives. Noonu Kedhikulhudhoo and Shaviyani Fonadhoo in the North Maldives suffered less from the tsunami, and spared destructions due to the presence of large Kulhi. However, Noonu Maafaru with no distinct differences in the physical characteristic as Noon Kedhikulhudhoo except presence of kulhi, have been badly hit by tsunami. 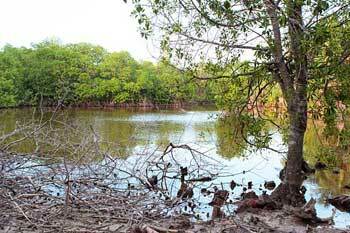 In Haa Dhaal Filladhoo, mangroves played second line in defence against deadly tsunami waves. Locals in both Fonadhoo and Kedhikulhudhoo call their islands as "safe island". Mangroves with hanging long branches into sand and below the surface of water absorb the shock of tsunamis. Behind mangrove trees there is a second layer of native plants, which are taller and slow down the waves. Mangrove roots with aerial roots and salt-filtering tap roots not only provided support in uneven soils but held up currents and storms. Adams, D., 1988. Plant life. In: Paul A. Webb. Maldives people and environment . Identification. Report No. RAS/79/123. Rome: FAO. 40p. Untawale, A.G. and T.G. Jagtap, 1991. Scientific report on status of atoll mangroves from the republic of Maldives. Unpublished manuscript. National Institute of Oceanography. India. Goa.